Wrap dresses are one of those classic silhouettes that's always around, but they're definitely having a moment this year. I've spotted lots on my fellow bloggers and in stores lately, but I was most excited to see one of my favorite brands, Everlane, introduce a series of four wrap styles in their Go Weave fabric. I was so excited, I actually entered a contest on their Instagram to shop a private event in their San Francisco store last Friday—and I won! So I dragged my boyfriend (who, to be fair, managed to do some shopping of his own) out to the store, and in the name of journalism, I tried on all of the styles to find just the right one. This was the winner. 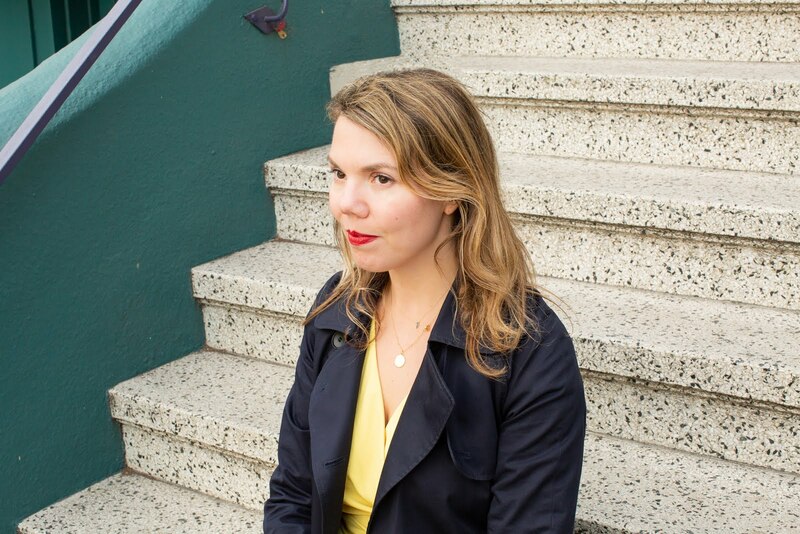 Everlane's wrap dresses come in five colors, two silhouettes, and two lengths (although not all colors come in all styles). Fresh off my mustard kick, I honed in on the yellow and grabbed the midi-length sleeveless and the mini short-sleeve fits. While the sleeveless was more feminine, it was also a little too booby for my taste (I'd have to pin it or have an extra hook sewn in); I went with the short-sleeve mini because I felt a little more comfortable in it, and thus figured I'd actually wear it. I should note, however, that both were bra friendly, although most of the Everlane workers in the store were wearing a T-shirt underneath theirs. The dresses are really well constructed, with an inner tie to hold things in place, and an outer tie that wraps to the front. Bonus: this style has pockets. The fabric is Everlane's Japanese Go Weave, which is a nice, weighty acetate with a beautiful drape and slight sheen. They're also true to size—I'm in a 6, for reference. The best part, though? All of the styles are $100! I went through several jackets in my closet—denim, leather, army—before landing on this trench, also by Everlane, coincidentally (and last seen here). Black and yellow made me feel a little like a bee, and green and yellow was a bit too earthy. 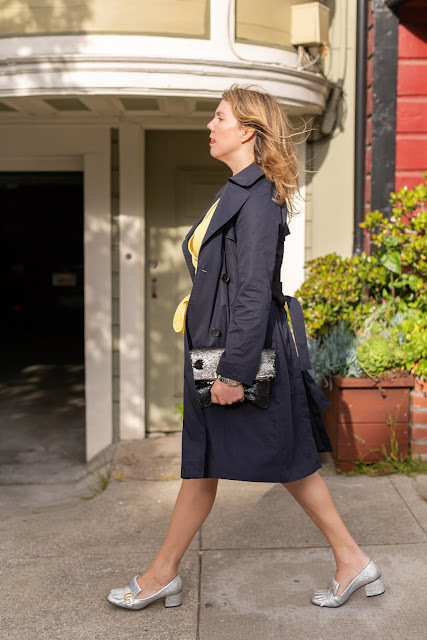 I thought the navy and yellow looked pretty fresh together, and while the entire look was a bit more dressed up than I had originally intended, I think a different choice of shoes and bag could totally make it more casual. The last time I wore these loafers (last seen here also), I mentioned that they look best with pants, and in looking at these photos, I think I probably should have worn a different pair of shoes. The strong horizontal line at the instep kind of cuts off the leg, making them appear a bit chunkier than they are (or maybe that's just all the carbs I ate in Chicago). I do still love them, however. The combination of gold jewelry and a silver bag (last seen here) and shoes probably seems counter-intuitive, but going all silver with my jewelry would have been too much silver, and too matchy-matchy. Also, these are some of my favorite pieces. Fun fact about these photos: we shot them Sunday afternoon a block away from the Panhandle, along the Bay to Breakers route. For those of you who aren't San Francisco residents, Bay to Breakers is a race where a lot of the participants run in costumes, then people dress up and walk the entire route while partying (the cops look the other way). While the festivities were long over, there were still quite a few stragglers who'd walk by us and drunkenly comment on our photo shoot. Embarrassing....and amusing! I love your wrap dress! That shade of yellow is so pretty on you! That yellow is so fun and bright for spring. 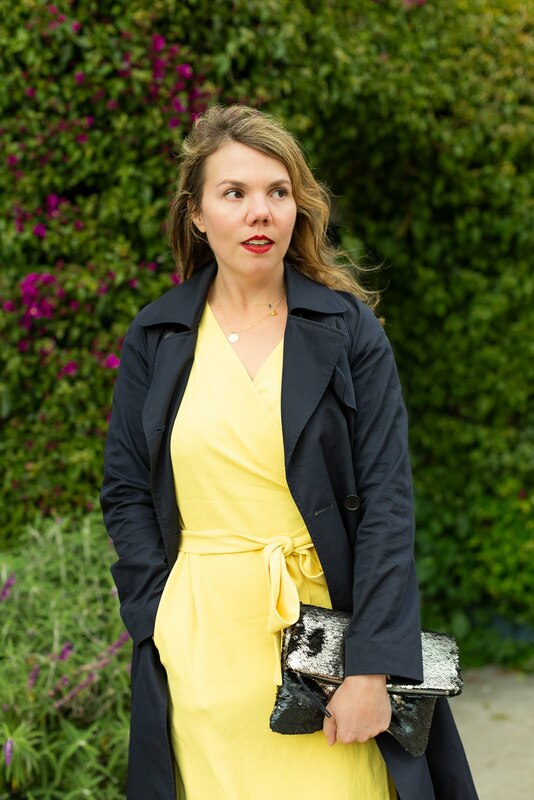 I love the trench coat with it, totally makes it perfect for spring! That color is so stunning on you! Gorgeous. Yellow is my favorite, and wrap dresses are so ladylike and pretty. I've had my eye out for a good one! This is a beautiful dress on you Cheryl. I love yellow - not always the case, but think it is just so uplifting to wear in the summer. your trench looks great with it. I will always love those shoes no matter what you wear with em! Love the yellow wrap dress!